Description - Our Free Time turf flooring is one of our premium turf rolled products. Great for both outdoor and indoor applications, this rolled flooring is the perfect alternative to natural grass. These turf rolls feature holes in the backing allowing water to easily flow through. Easy to install and maintain these rolls will look great for many years to come. Recommended Uses – Free Time turf rolls are great for both indoor and outdoor applications and have been used as an alternative to natural grass in yards, as doggy daycare flooring, as flooring for pushing and pulling sleds, on putting greens, in batting cages, as walkways, in baseball dugouts and much more. Sold 'As Is.' No warranties apply and no returns permitted. 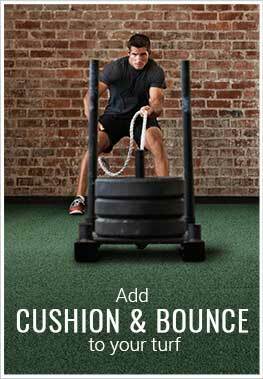 Great for CrossFit gyms, pulling sleds, and much more.